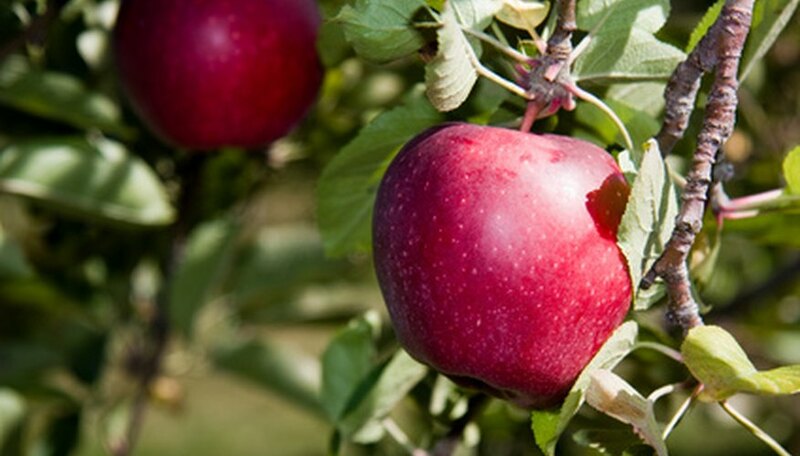 Only certain varieties of fruit trees are susceptible to rust, namely apple and pear trees. This disease comes from a fungus named Gymnosporangium. It can cause unattractive spots on the fruit trees that lead to leaf and fruit drop. Treating rust on fruit trees requires a combination of methods. If you catch the disease early, and eliminate it, your tree should survive the disease. Confirm the existence of rust on your fruit trees so you can treat it properly. Examine the leaves, looking for yellow or orange spots on the top side of the leaf. The underside of the leaf will show wart-like growths with spores growing out of them. Sometimes the fruit of the tree will show similar symptoms. Prune off infected leaves and branches in the winter with pruning shears. Clear out the diseased material and throw it away. This will get rid of the spores that spread the disease. Clean your pruning shears with rubbing alcohol to disinfect them afterward. Look for any junipers or cedars in your yard with bright orange, gelatinous growths in spring. Rust requires an alternate host to infect the fruit trees. Pick off these growths before they have a chance to germinate and spread. Spray the fruit tree with a fungicide containing ferbam or zineb when it blooms. Make sure the fungicide lists your fruit tree before using it. Spray again when most of the flower petals have fallen off the tree and again 10 days later. Repeat this cycle until the fruit tree shows no sign of disease.